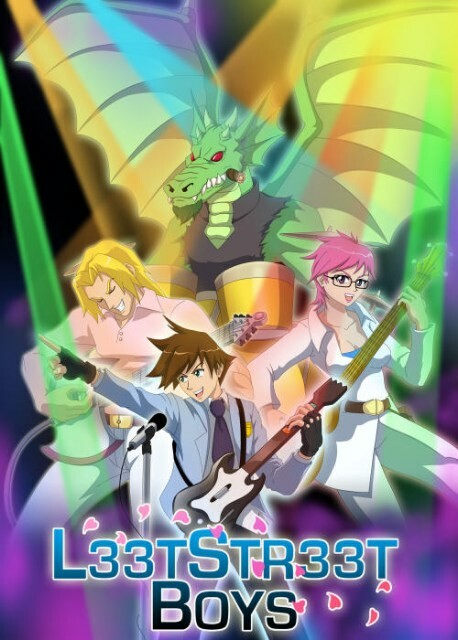 LeetStreet Boys (also known as L33tStr33t Boys) is an Anime otaku fantasy band most well known for its single and music video "Yuri the Only One". Founded in 2007 by vocalist/songwriter Matt Myers, and guitarist/producer Ryan Frogs McCormack, the band centers around a prep school punk singer (Matt), a metrosexual elf guitarist (Justin), a lesbian healer bassist (Rose) and a fire breathing dragon drummer (D-Dos). Its name is a spoof on Backstreet Boys, with the number 3s replacing the letter Es to form the popular gamer slang word, "l33t". Matt and Frogs briefly played together in high school, and reconnected when Frogs came to Boston on a band tour. The two realized a mutual interest in anime, and began collaborating on select video game and anime music projects. Based on an acoustic demo of "Yuri the Only One" for a live performance at ConnectiCon 2007, Matt and Frogs teamed to produce a full band arrangement of the song. Nathan "N8" Soria was subsequently hired to produce an animated music video featuring original fictional characters as well as well-known anime and video game icons. Debuting at Anime Boston 2008, the video was posted on YouTube, where it quickly garnered over half a million views and was discovered by Video Games Live executive producer Tommy Tallarico, who put it into rotation as part of the Video Games Live show. Since then, "Yuri The Only One" has been screened at numerous Video Games Live events throughout North America, South America, Europe and Asia; the song single also appears as a bonus track on the album "Video Games Live: Greatest Hits Volume 1". The LeetStreet Boys released their self-titled debut album "LeetStreet Boys" in February, 2009, and are currently supporting it with performances on the North American anime convention circuit, including recent appearances in Los Angeles, Alaska, Boston, New York, Missouri and Texas. Matt and Frogs continue to head the group as its only permanent members, producing a wide array of branded multimedia product, from music and music videos to webcomics and video games. Japan itself mocked the LeetStreet Boys and the related Wapanese phenomenon on Netstar . Strangely, the group seems to be totally unaware of this, thinking that they have gained prominence in Japan and this was a tribute. They also have a webcomic. All Drummers Are Animals: A dragon as the drummer is probably justified by this trope. Instant Awesome: Just Add Dragons! : D-Dos. It's stated that he's not the only dragon in the universe. Shout-Out: Matt wears a Ouran High School Host Club uniform. You Gotta Have Blue Hair: Rose, who has pink hair. You're my Angel straight out of Tokyo-3. Also, "For Yuna and Zelda and Chi, I'd do anything. For Yui, I'd do anything." The names are supposed to be an Incredibly Lame Pun on "you", but just sound like he's more interested in anime girls than the supposed target of his affection. Concept Video: Most of their official music videos are to some degree, but the one for "Guitar Hero Hero" is the best example. Cover Version: They released a cover of Rick Astley's "Never Gonna Give You Up" (under the title "Rickroll") for April Fool's Day 2009. Double Entendre: The song "Masquerade" has the line "My Buster Sword's about to Limit Break" when the singer/narrator first meets the girl. Gratuitous Japanese: The song "Haruhi" contains the line "nihongo benkyo shimasu" (written in the official lyrics as "ni hongo ben kyo shimasu", which translates to "studying Japanese". It's deliberately pronounced in a very American way. Their official videos also contain Japanese translations of the lyrics. Hurricane of Puns: Most of their songs are, or contain, these. Improbable Weapon User: In the video for "Guitar Hero Hero", Matt attacks Trolls with a Guitar Hero controller. He is also seen in other videos playing it like a real guitar. Incredibly Lame Pun: "My Kingdom Heart is breaking". The actual term, Kingdom Hearts, in fact refers to singular entity, although like with the Gratuitous Japanese example, they probably already knew that. Mondegreen: Almost every fan of theirs who hasn't looked at the official lyrics page mistakes the last line of the song "Masquerade" as "Tonight I'm gonna get... laid!" thanks to the persistent Subverted Rhyme Every Occasion throughout the song (after setting up a rhyme with "Masquerade", the chorus ends with "Tonight I'm gonna get" and then immediately goes on to the next verse). The line is actually "Tonight I'm gonna get Lain", a reference to Serial Experiments Lain. Reading the Stage Directions Out Loud: A partial example in "The Fanboy Of The Opera": one line is literally sung as "I g2g now frowny face emoticon". Save the Princess: In the video for "Guitar Hero Hero", and mentioned in "Otaku Anthem (I Wanna Live)". Shout-Out: Common given their style. "Guitar Hero Hero" namedrops "Through The Fire And Flames" in the lyrics, and one of the songs is called "Haruhi" (though fan opinion is divided as to which Haruhi they're referring to). Lots of video games and anime are also mentioned by name in the lyrics, usually in a punny way. "The Fanboy Of The Opera" contains the line "Pay no attention to the man behind the curtain", a standard Shout-Out to The Wizard of Oz. "LeetStreet Fighter" even gives a Shout-Out to Penny Arcade. In "Yuri The Only One For Me," every line contains at least one Shout-Out. The video for Cosplay Girlfriend has the titular girlfriend appearing in various costumes while the boyfriend has a matching Fun T-Shirt. Talks Like a Simile: Constantly.